Come aboard Quack'rDuck for your Surfers Paradise adventure! 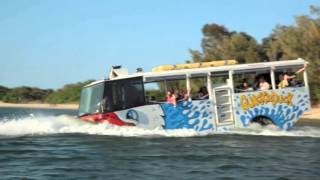 Reward yourself with an experience of a lifetime and ride the world’s most modern and environmentally friendly amphibious vehicle, the Quack’rDuck on the Gold Coast. Discover Surfers Paradise on the Gold Coast like never before. By esplanade, travel alongside Surfers Paradises idyllic beaches and past Narrownecks man made surfing reef. Watch the excitement of Sea World from your elevated seating position, then get ready for the excitement of the big splash into the Broadwater, only to be relieved to find out that the Quack’rDuck really can swim. Cruise past Marina Mirage and the Millionaire homes of Paradise Waters. All this and lots lots more. Come aboard Quack'rDuck for your Surfers Paradise Adventure.